Although Charlotte offers a number of great winter activities for all ages, the city itself isn't too conducive to skiing. Fortunately, Charlotte is not that far from world-class skiing areas in the Blue Ridge Mountains of North Carolina, perfect for a day or weekend trip from the Queen City. If you're planning some outdoor family fun this winter in Charlotte, consider booking a room, private lodge, or cabin at one of the fantastic resorts and ski areas of the region, each of which offers guests a variety of winter activities like skiing, snowboarding, ice skating, tubing, and even some guided snowshoe tours. Check out each location's website for special events and discounts, and choose one of these ski destinations—all within three hours of Charlotte—so you can plan and book your perfect getaway this winter. 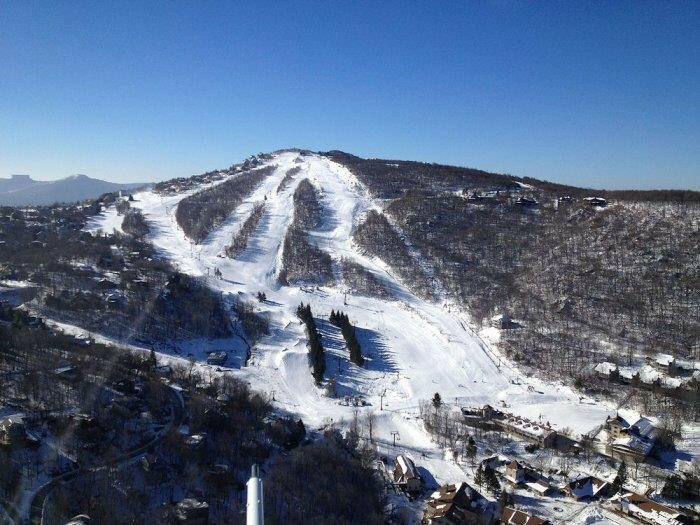 Weather permitting, open from November through March and just over two hours (or 117 miles) from Charlotte, the Sugar Mountain Resort in Sugar Mountain, North Carolina offers visitors a chance to ski, snowboard, tube, snowshoe, and ice skate down a variety of courses and slopes. If you're planning on making a weekend trip out of your skiing adventure, consider staying in one of the Sugar Mountain Village houses or other on-site accommodations. There's also several restaurants, shops, and rental stores at the resort, so you don't have to worry if you forgot to pack a scarf or are getting hungry on the slopes. See what runs are open today on the Ski Sugar website. You can also request the 2018 - 2019 brochure online. Nestled in the Blueridge Mountains of Saphire, North Carolina, the Sapphire Valley Ski Resort is just 147 miles (or three hours) southwest of Uptown Charlotte. Complete with a Four Seasons Grille, this small mountain resort is a more economical way to enjoy the winter slopes of the region, offering visitors relatively cheap vacation packages, equipment rental, and even dining compared to other resorts mentioned on this list. The resort offers skiing, snowboarding, tubing, and zip line tours. You can even get ski instruction for yourself or your kids, so if you're looking for a fun way to introduce your family to skiing near Charlotte on a budget, Sapphire Valley is the place for you. Their 2018 - 2019 Ski Brochure is available online for downloading. Situated in the mountains near Maggie Valley, North Carolina, the Cataloochee Ski Area offers "Kids Ski Free" days as well as a host of other special events throughout the ski season. Just 156 miles (three hours) from Charlotte, this all-inclusive ski area makes for the perfect day or weekend trip for winter sports. During the month January, Cataloochee offers special discount packages to celebrate "National Learn to Ski & Snowboard Month," so if you're planning a trip that time of year, you might want to check out the deals featured on their website. Beech Mountain Resort in Beech Mountain, North Carolina is just 123 miles and three hours away from Charlotte and opens November 23, 2018, for its 2018 to 2019 winter season. Beech Mountain offers guests four restaurants, two sports shops, a slew of accommodation options, and 17 total trails—including three easy, seven medium, and four difficult slopes along with two freestyle terrain areas. The Beech Mountain Brewery is onsite, so if you're a fan of local brews, this resort is definitely worth checking out for the craft beer alone. The Appalachian Ski Mountain in Blowing Rock, North Carolina is just two short hours (98 miles) away from northern Charlotte. This ski mountain officially typically opens in mid-November and remains so through late March (weather permitting). At Appalachian Ski Mountain, you can ski at night because the slopes, as well as an ice rink for skating, have been lit to accommodate late-night visitors. It also offers a slew of special events throughout the ski season, so be sure to check out their website for an up-to-date schedule. Located in Mars Hill, North Carolina, just 163 miles (three hours) from Charlotte, Wolf Ridge Ski Resort challenges visitors to "Dare to Ski the Wolf," which offers three Black Diamond, eight Blue, and four Green courses that challenge beginners and experts alike. Because of its location right off the state's only official "scenic highway," I-26, visitors can expect fantastic views of western North Carolina and relative ease getting to this resort from Charlotte. There are also a number of cabins, houses, and rooms that you and your family can rent if you want to make a weekend of visiting this ski resort. Check out the official Wolf Ridge Ski Resort website for pricing and availability, and remember to book your reservations early as the slopes can get rather packed in the height of ski season.